Most people like to sleep late on a Saturday morning, but on Jan. 17, more than 4,000 people, ranging from tweens to seniors, are wide awake not long after the crack of Saturday’s dawn. That’s been the case in Atlanta for the last ten years each third Saturday in January. At the Renaissance Waverly Hotel and Cobb Galleria, hordes of students and teachers come from around the country to attend Junior Theater Festival. There the kids perform fifteen-minute excerpts from the school musicals they either did in the fall or plan to mount in the spring. Actually, this year the correct term is “around the world.” For in addition to representatives from 27 states and the District of Columbia, one troupe from Australia and another from South Korea will be here to see exactly what goes on in Junior Theater Festival. After each segment, they’ll see if they agree with the adjudicators who give what they feel are the pluses and minuses of each production. Regardless of age, attendees sport more T-shirts than Bruce Vilanch has worn in his entire lifetime. Some teachers and students wear ones that are coordinated with the coded colors of their rooms to which they’ve been assigned; others celebrate the musicals they’re doing. 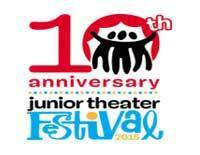 No question that manufacturers of T-shirts will flourish as long as Junior Theatere Festival exists. Although no group actually performs until 8:45 a.m., thousands are milling around much earlier in the 65,000 square-feet Broadway Junior Theatre. In it are more blue chairs than you’ll find in all the IKEAS worldwide – and yet, few chairs are occupied now. What a contrast to what will happen here on Saturday night, when the place will be packed to see the “New Works Showcase.” Selections from four new works added to the Broadway Junior Series -- the hour-long abridgements of hit musicals -- will be previewed: Elf JR. (performed by the Play On Players of Duluth, GA), Singin' In The Rain JR. (Ohlook Performing Arts Center of Grapevine, TX), James And The Giant Peach JR. (Gwendolyn Brooks Middle School of Oak Park, IL) and The Lion King Experience, both in a JR. version and in a 30-minute KIDS edition. Ohlook Performing Arts Center students perform 'Singin' in the Rain'. Photo by Marcus Woollen. Freddie Gershon, the CEO of Music Theatre International who founded Broadway Junior a couple of decades ago, says that since the concept was introduced, 100,000 Junior productions have yielded 500,000 performances. Now there will be more. For those kids who care to write their own musicals – and plenty of tweens and teens in hallways and lunchrooms are doing just that on notepads and iPads – some composers and lyricists are here to inspire them. They include Benj Pasek and Justin Paul, Tony-nominees for A Christmas Story and Lucille Lortel winners for Dogfight who have just been signed to provide songs for Hugh Jackman’s next film: a musical about the life of P.T. Barnum. A walk through any hall in the vast complex finds at least a few kids singing “For the First Time in Forever,” “Do You Want to Build a Snowman?” and, of course, “Let It Go.” So won’t kids be excited to encounter the husband-and-wife team that wrote those hits and the rest of the Frozen score? Some will be genuinely frozen with awe to encounter the Oscar-winning duo of Robert Lopez and Kristen Anderson-Lopez. There are smiles aplenty outside the theater, too, in the surrounding halls, where one student after another goes to the giant-sized mock-up of a Playbill. There’s a nice empty space under the yellow banner so that kids can stand in front and have their images preserved as if they were gracing a genuine program. Students from the Roy Waldron Middle School. 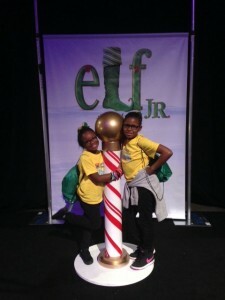 The sounds of more iPhones and digital cameras are heard clicking in front of the Elf, JR. display where kids lean against its North Pole pole. A girl is at the Singin' In The Rain JR. pavilion, grabbing an umbrella, jumping onto the base of a lamppost, holding onto it with her left hand as her right, clutching that umbrella, is extended far in front of her a la Gene Kelly. How wonderful to see that this 1952 classic film is one that at least one girl hasn’t ignored. And that, dear friends, is what Junior Theater Festival is all about. Over 100 schools, after-school companies or weekend programs will show their wares here – indicating quite a growth. In 2003, 650 were in attendance. Back then, far fewer “pods” – rooms to accommodate performers -- were required; colors were used to demarcate one pod from another, but not even all seven colors of the spectrum were needed. Now, however, with students singing, dancing and acting in 13 different locales, the pods still use the original red, orange, yellow, green, blue and purple, but have been buttressed by the additional fanciful hues of chocolate, gray, gold, lime, magenta, maroon and navy. Given that the festival keeps growing, look for aqua, cantaloupe, chartreuse, tangerine and mustard to be soon pressed into service. But that’s the future. Right now, teachers are shepherding their students into what are usually banquet rooms. We who are lucky enough to be here will be served a banquet of talent, tunes and terpsichory. To quote the Newsies: “Read all about it!” – albeit next Friday. You may e-mail Peter at pfilichia@aol.com. Check out his weekly column each Tuesday at www.masterworksbroadway.com and each Friday at www.kritzerland.com. 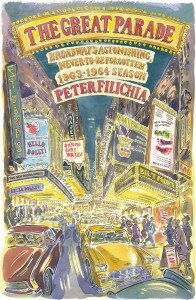 His upcoming book The Great Parade: Broadway’s Astonishing, Never-To-Be Forgotten 1963-1964 Season is now available for pre-order at www.amazon.com. @FranciscoRenard @SankoffandHein Our apologies. We wanted to let you know that we sent you a message. We'll be in touch!